Gill Park Cooperative is an affordable apartment community located in Chicago, Illinois. Gill Park Cooperative is an apartment community containing 259 assisted rental units. The property contains 465 assisted bedrooms and, based on typical apartment occupancy limits, Gill Park Cooperative is home to 891 tenants when fully occupied. Constructed in 1969, the Gill Park Cooperative high-rise building needed to upgrade the window treatments that were installed in each unit. The previously installed window treatments were not dependable or stable, causing frequent repair/replacement. The Gill Park Cooperative management team needed an economical and effective and durable window shading system. 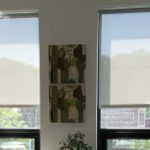 In the Gill Park Cooperative building, units with at least one bedroom required blackout shades in the bedroom and solar filtering shades in the living room. Studio units required only blackout shades. IWS designed a window shading system that is easy to operate, controlled the effects of the sun, and that could endure years of use. – All room-darkening shades were made with NoLite Fiberglass Oyster with 0% openness. In order to successfully and properly shade each unit in the Gill Park Cooperative building, Illinois Window Shade Company created a window shading system that addressed each of the needs of the client. A total of 1,768 Illinois Window Shade Company Clutch Operated Roller Shades were installed throughout the Gill Park Cooperative building. Heavy duty clutches with 16 lbs. of lift were used on each roller and a #10 stainless steel beaded chain was utilized to control the shade. The bead chain hangs at the side of each individual shade while bead-stops prevent the shades from being raised or lowered too far, ensuring years of trouble-free usage for tenants. Each shade on floors 2-4, was fitted with room darkening fabric NoLite Fiberglass (Oyster). Room darkening fabric blocks all light, offering the ultimate in visual privacy and UV protection. 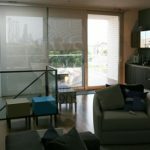 Each living room shade on floors 5-27, was fitted with woven mesh transparent fabric (Mermet E-Screen 5%, Linen/Linen). NoLite Fiberglass (Oyster) was used in the bedrooms. This percentage of openness was ideal to solve the solar control challenge because it provides exceptional view through of the exterior while simultaneously protecting the interior from UV rays and glare. As a nationwide leader in window treatments, Illinois Window Shade Company provides the most effective solar shade solutions available. Each unit in the Gill Park Cooperative building is now furnished with high-quality, easy-to-use clutch operated shade systems. These systems proficiently filter or altogether blackout all sunlight and glare, giving tenants a more comfortable living space. With a smooth pull on the bead chain, the shades offer a simple to operate control method that keeps the fabric clean for months at a time. Property developers and architects across the country are working to design sustainable solutions that reduce construction and operating costs while enhancing tenant safety and comfort. The proper window shade addresses these challenges in a cost effective and practical manner. Well-designed motorized and manual shading solutions not only save energy and money, but also optimize natural light.